India’s progress in leprosy eradication efforts has been spectacular and the participatory work by governmental and voluntary agencies is laudable, observed Dr. Moos in Mumbai on Friday. 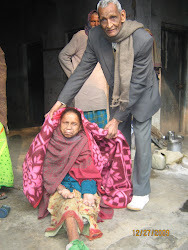 We are happy that the cherished dream of the Father of our nation for leprosy elimination has come true, she added. Dr. (Mrs.) Meher Master Moos, President, Zoroastrian College was speaking as the Chief Guest of Indian Development Foundation’s (IDF) 23rd Foundation Day Function at Master Dinanath Mangeshkar Hall on 28th September 2007. She gave away IDF Grants to leprosy/ TB hospitals and projects in western region. IDF has earmarked Grants totaling Rs.46 lakhs to 83 health/ development projects all over India during the year. 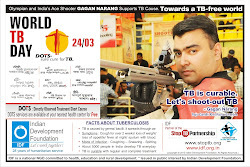 IDF Grants Release Function is an annual feature of Indian Deve lopment Foundation to share its resources with leprosy/ TB projec ts and promote self-reliance. Dr. Moos presented Awards to 28 Principals of Schools in Western zone with star performance record of leprosy awareness programmes and resource mobilisation and awarded Medals and certificates to 142 students for their signal contribution. 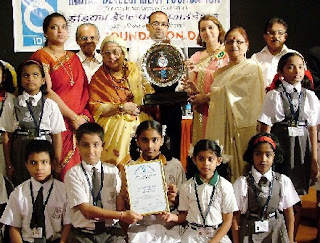 Prestigious Mother Teresa Memorial Award 2006-07 was presented to NEW HORIZON PUBLIC SCHOOL, Airoli, Navi Mumbai for outstanding health awareness, resource mobilisation and humanitarian service in the areas of leprosy/ TB work in Western India during 2006-07. The Schoolteam from New Horizon Public School headed by the Principal Mrs. Bulbul Sengupta and V ice Principal Mrs. Jyoti Nair received the Mother Teresa Memorial Award. SOCIAL ACTION AWARDS 2006-07 were presented to Principals and Teachers from Western India for their excellent Social Responsibility during 2006-07. Dr. A. R. K. Pillai, President, Indian Development Foundation who presided over the function said the government and voluntary agencies worked hand in hand with admirable co-operation to achieve spectacular results by bringing down the number of leprosy patients in India from forty lakhs in 1982 to less than one lakh to the end of March 2007. Dr.Pillai thanked the public for their understanding and continued support. Sharing resources and serving others give greater joy and this will be the gospel for the future, Dr. Pillai added. Dr. Vandana Lulla, Director, Podar World School and Dr.Dinesh Jain, Medical Co-ordinator, German Leprosy & TB Relief Association were Guests of Honour at the functi on. They complimented Indian Development Foundation’s role in India’s fight against leprosy/TB and for widening its activities to include health care, education and development. New Horizon Public School, Airoli topped the list in resource mobilisation for leprosy/ TB while the second and third places went to Podar International School, Santacruz and Snehavardhak Mandal's Shaikshanik Trust, Talegaon respectively. Nitin N. Nair from Bal Vikas Vidyalaya, Talegaon topped the list of students in resource mobilisation for leprosy/ TB work while Smrthi Karthik and Vishwa S. Gangan from DAV International School, Mulund got second and third positions respectively. People from all walks of life attended the well organised function. Earlier Dr. C.N.N.Nair, Trustee and Secretary of the Foundation welcomed and introduced the VIPs, while Dr. Sharad Nayampally, IDF Social Ambassador proposed a vote of th anks. Dr. Narayan B. Iyer, Co-ordinator, IDF compered at the function. Students of G.M.E.S. High School, Vile Parle and St. Catherine's High School, Andheri (W) rendered the invocation prayer and national anthem. We look forward to your active participation in the IDF events. IDF Grants are given out of donations received from the general public. Please do come and share the joy of participation. The function for Karnataka Region Projects/ Schools will be held during the first week of November at Bangalore. Indian Development Foundation a leading national NGO committed to health, education and rural development, in collaboration with Podar International School , Santacruz (W) will be organizing JUHU BEACH – CLEANLINESS DRIVE on POST GANPATI VISARJAN (26th Sept. 07) starting from 9:00 AM. About 500 students from Podar International School will take active part in the CLEANLINESS DRIVE as part of their social responsibility programme. A large number of volunteers and social workers are expected to participate in this mega-drive. There are many volunteers from other schools who wish to join hands in this event. Also a couple of celebrities are likely to join to support the movement. May we request your goodself to take active part in this event at 9:00 AM and help in Juhu Beach Cleanliness Drive . 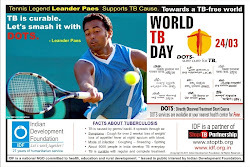 Lets join hands in this noble mission. Looking forward to meeting you at Juhu Beach on 26th Sept.
Wow, a small computer looks like a toy. Does this toy functions like a bigger computer, asks 6 year old Jhanvi. I am very happy to see a laptop and the touch on keyboard is very smooth like butter, expresses Monika who along with 30 girls from Vimala Centre visited Podar International School campus located in Santacruz West, Mumbai. Podar International School (IB) in collaboration with Indian Development Foundation organized a `Teach and Reach’ programme for the children of Vimala Dermatological Centre, a leprosy home in North Mumbai as part of Teachers’ Social Responsibility on 1st Sept. 2007. `Teach and Reach’ programme was specially organized by the International Baccalaureate students from Podar International School to teach and reach-out children of Vimala Centre. The Director/Principal of Podar International School Dr. Vandana Lulla said it gives me immense pleasure to see that our students have played the role of teachers and taught the visiting children fr om Vimala Centre about computer and laptops. Every child of this modern world should be given an exposure to the technological updates. Vimala children are dear to me and I keep visiting the Centre and meet leprosy patients, Dr. Lulla said with a smile. The children still remember the song `Hum honge kaamyaab’ which I taught them during the New Year eve. When we talk about Corporate Social Responsibility, schools should think of `Teachers’ Social Responsibility’. Teachers Day gives us an opportunity to come forward and do something for the society. The President o f Indian Development Foundation Dr. A.R.K. Pillai said we have always been in the forefront in bridging the gap of haves and have-nots. 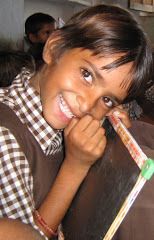 IDF is a national NGO networking with several thousand schools in India and this gives us an opportunity to bring children from various centres availing technolo gical and academic updates. It is the need of the hour that every teacher should come forward towards empowerment of the children. Teachers’ Social Responsibility and Students’ Social Responsibility are the special terms coined by IDF in order to have a greater social action programmes, asserted Dr. Pillai. IBDP student Sehar welcomed the guests and spoke about Teach and Reach programme, and it was explained in Hindi by Hitesh and Navdeep for the benefit of the visiting students. Dr. Narayan B. Iyer, National Co-ordinator and Dr. Sharad Nayampally, Social Ambassador from IDF led the Vimala children and expressed happiness on the children getting such an international exposure. Dr. Rinku Jain, Dental Surgeon was a Special Invitee for the programme who spoke on the importance of smiling and oral health to the children. Mr. K. X. George, Academic Co-ordinator, Mrs. Prema Mathew, IBDP Co-ordinator, Mrs. Shahina Momin, PYP Co-ordinator and Mrs. Sarala Gavane, CAS Co-ordinator in collaboration with the students and teachers organized the entire event in a masterly manner. Rev. Sr. Mary from Vimala Centre thanked Dr. Vandana Lulla and the Podar International School team for giving an opening to her children to the world of Windows. It will really create an impact on our children towards their further development, said Sr. Mary. The programme ended with a cultural event depicting various teacher-student relationship for a better society. Mangalorean.com has also given a wide coverage of the event. For details klick the link.